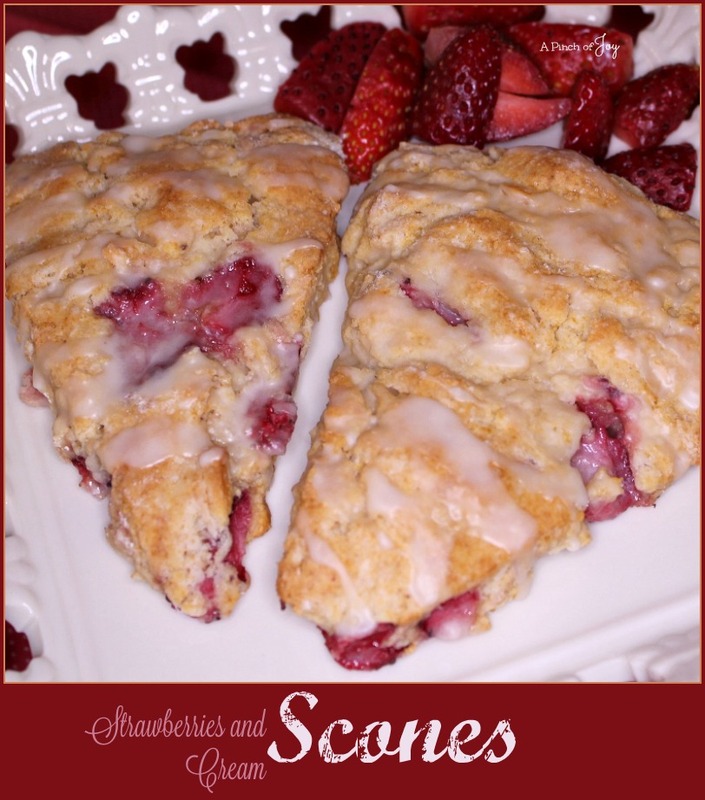 Strawberries and Cream scones are tender, golden and not too sweet, perfectly punctuated with ruby berries and a light glaze and will make any breakfast or brunch special. They look like you spent hours in the kitchen, but really are easy to make. Prepare the berries ahead of time and refrigerate until you need them. Pop off the green leaves, slice each berry into quarters until you have a full cup. I like to gather all ingredients before starting to mix. Get the egg from the refrigerator and grab the butter and cream and refrigerated strawberries at the same time. Set out the flour, baking powder, salt and both kinds of sugar. In my Ohio kitchen, they were all in the corner lazy susan and I just used them from there. Here I have to carry them to and from the pantry – I’m still thinking about how to better organize this kitchen. Then grab the vanilla from the cupboard. If I’m feeling really organized, I will also set out the needed measuring spoons and cups. More likely I will grab them from the nearby drawer and cupboard as needed, along with the whisks, spatulas and other tools. Having everything ready to go in one place really does speed things up! Mix the dough with a light hand. Handling the dough too much will cause it to be tough. Do take the 5-6 seconds needed to mix the baking powder, and salt into the flour so that they are evenly distributed before adding the eggs. After that, don’t worry about getting everything mixed smoothly. The dough should be on the rustic side. 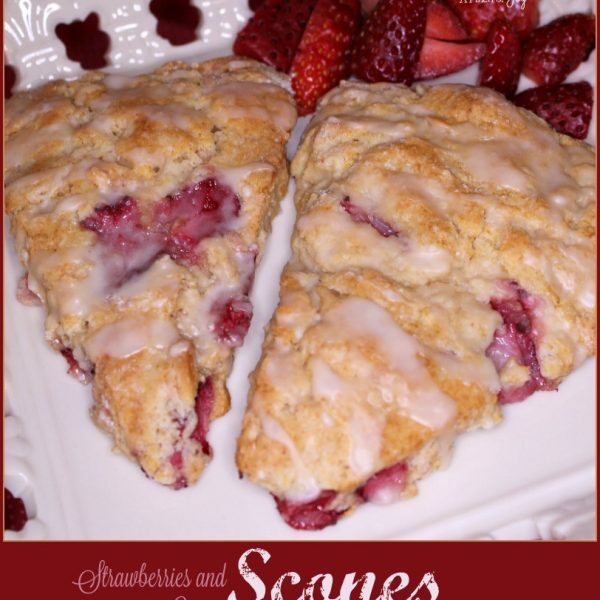 Cream adds a nice flavor and texture to the scones. Use heavy whipping cream if you have it, but you can also use half and half or anything in between. You may have to adjust the baking time a minute or two to account for the butterfat in the whole cream (more time) or the lack of butterfat in the half and half (less time). Scones should be lightly golden brown. Prepare berries. This can be done at an earlier time, as well. Measure flour, baking powder, alt and sugar into large mixing bowl and whisk lightly to mix dry ingredients together. Slice cold butter into the dry ingredients. Using a pastry cutter or fork, cut better into the dry ingredients until coarse pea sized crumbs form. In a small mixing bowl, whisk together the cream, egg and vanilla until well mixed. Pour the egg mixture into the dry ingredients and stir gently until the dough begins to form a ball. Add chopped strawberries and carefully fold into the dough. Do not over mix. The dough will be crumbly and strawberries will still be loose. Turn dough out onto lightly floured surface and gently knead the berries and moisture into the dough. When it holds together, press it into a circle about an inch thick. Cut the circle into 8 equal pieces and place on the lined baking sheet, leaving a small space between them. Bake at 400 for 15 – 18 minutes until lightly golden brown. Let cool for 10-15 minutes on the baking sheet and then remove to cooling rack. While scones are cooling on the rack whisk together all the glaze ingredients until smooth. If needed add additional liquid or powdered sugar to achieve a consistency that will flow easily from a teaspoon. Moving quickly, distribute the glaze equally over the 8 scones. Let set until glaze hardens, about 10 minutes.